If there's one thing that I learned from last week's column on the 100 players most hated by their hometown fans, it's this: 100 isn't a big enough number. The e-mails chastising me for missing various jerks and underachievers are still pouring in. Obvious omissions (Vince Carter and Jeff George), not-so-obvious ones (Lin Elliott) and players that didn't meet the ground rules (Barry Bonds and Kobe Bryant are liked by many of their hometown fans, but still got skewered by many of you) all found their way to my inbox. But the most popular question was, "How about a separate column for owners, general managers and coaches?" You got it. But first, a few caveats. You might hate George Steinbrenner and may have despised Marge Schott, but enough Yankees and Reds fans liked both that neither makes the cut. Also note that we're sticking to the four major professional U.S.-based team sports. That means there won't be a list of every UCLA basketball coach after John Wooden, every Alabama football coach after Bear Bryant, or Peter Ridsdale, the former chairman of Leeds United who drowned the club in debt, then jumped ship. The honorable mention choices often refer to owners, GMs and coaches who earned mixed reviews. For instance, Red Sox fans loved the early-career Dan Duquette who acquired Pedro Martinez but hated the Duquette who clashed with managers, dodged the media and oversaw a bunch of teams that fell just short. The same goes for Bears fans and later-career versus early-career Jerry Angelo. While I made a concerted effort to go back in time as much as possible (Harry Frazee did most of his damage before 99.8 percent of you were born), the list definitely skews more toward recent happenings. Finally, I'm ranking the owners, GMs and coaches/managers in three separate categories. Want to make a Browns fan lose his lunch? Show him this picture. 1. Art Modell, Cleveland Browns: For all the dark days that Cleveland sports fans have had to endure, none was more painful than Jan. 28, 2001. 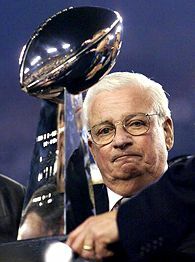 On that day, Modell held up the Lombardi trophy for the Baltimore Ravens' victory in Super Bowl XXXV. All Modell did leading up to that point was run the franchise's architect (Paul Brown) and the best player in Cleveland history (Jim Brown) out of town, fudge stadium accounting data and turn one of the most successful franchises in sports into a perennial loser. All the while, Browns fans continued to rabidly support their team. Hatching a secret plan to move the team to Baltimore instead of selling to local interests who'd keep the Browns in Cleveland was merely the final indignity. 2. Robert Irsay, Baltimore Colts: Modell's track record before he moved the Browns out of Cleveland spares Irsay from topping this list -- just barely. Moving the team that brought the football world Johnny Unitas and the famous Colts quiz from "Diner" was bad enough. Going on TV to threaten city and state governments and Colts fans (while apparently drunk), then packing all of the team's belongings into moving vans and skulking off to Indianapolis in the middle of the night tops even Modell's gambit for its combination of greed and cowardice. 3. Jeffrey Loria/David Samson, Montreal Expos and Florida Marlins: The art dealer and his weasely son-in-law have become the Grim Reapers of Major League Baseball. In 1999, Loria bought a 24 percent controlling interest in the ailing Expos franchise for just $12 million, then installed Samson as his hatchet man. Loria canned popular manager Felipe Alou, then declined to show up for the press conference. He failed to secure any English-language TV or radio coverage for the team in 2000. Through a series of controversial cash calls, he assumed majority ownership of the team and sold it for a huge profit to the other 29 big league clubs. He was then rewarded with a sweetheart deal to buy the Marlins, thanks largely to a $38.5 million interest-free loan from Major League Baseball. Five years later, Loria and Samson have the Marlins on life support too, having failed to secure a stadium deal while bad-mouthing the team and the city to anyone who'll listen. Of course Bud Selig would rather have cronies like Loria on his side than vocal but committed owners like Mark Cuban, even if multiple cities have to suffer the consequences. 4. George Shinn, Charlotte Hornets: The complete résumé. Shinn oversaw a series of terrible personnel moves, tried to strong-arm the city into a new arena deal, then convinced the NBA to let him move the team to New Orleans instead of selling to another ownership group that would keep the Hornets in Charlotte. All of that paled compared to the reaction Shinn got after he was accused in a civil suit of sexually assaulting a woman. Though a jury sided with Shinn, he nonetheless was vilified wherever he went in Charlotte. Honestly, if all this happened in New York or Chicago, the groundswell of hatred would probably make him No. 1 on this list. 5. Bill Wirtz, Chicago Blackhawks: Estimated to be worth nearly $4 billion, "Dollar Bill" is the embodiment of the greedy, frugal owner who refuses to invest in his franchise and instead watches it fall into ruin. His refusal to pay Bobby Hull and Jeremy Roenick led to both players' leaving Chicago. He's also presided over the departures of Chris Chelios, Dominik Hasek, Phil Esposito, the Sears Tower, Wrigley Field and Lake Michigan. As a final slap in the face, Wirtz has blacked out Blackhawks home games for years. 6. Peter Angelos, Baltimore Orioles: He's the George Steinbrenner of 20 years ago, with all the meddling power plays and none of the hands-off check-signing. He's nixed trades for top prospects, run through managers like Alyssa Milano blazes through paesan pitchers and overseen 10 straight losing seasons for one of baseball's proudest franchises. 7. Bill Bidwill, St. Louis and Arizona Cardinals: Forty-five years of ownership, one playoff win. The Cardinals might be the single worst franchise in all of pro sports. 8. 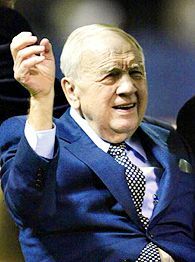 William Clay Ford, Detroit Lions: Forty-three years of ownership, one playoff win. In 2001, Ford was attacked by a band of marauding zombies, who subsequently ate his brain. In related news, Matt Millen has been the Lions' president and CEO ever since. 9. Walter O'Malley, Brooklyn Dodgers/Horace Stoneham, New York Giants: The twin moves that changed professional sports forever. 10. Bud Adams, Houston Oilers: Already hated for micromanaging the team in its early days (he had to personally approve all expenditures above $200), Adams' status among Oilers fans only worsened over time. In 1987, he threatened to move the team unless the Astrodome got significant improvements. The city responded by plunging $67 million into an upgrade, through a bond issue that would take 30 years to pay off. Just a few years later, Adams lobbied for a new stadium, citing the league's building boom. When he didn't get his way, he moved the team to Tennessee. 11. Calvin Griffith, Washington Senators and Minnesota Twins: Griffith first made enemies in D.C., transplanting the team to Minnesota a few years after inheriting it from his uncle, Clark Griffith. Speaking at a 1978 Lions Club function in Minnesota, Griffith revealed his reason for moving the team out of Washington: "I'll tell you why we came to Minnesota," he explained. "It was when we found out you only had 15,000 blacks here. Black people don't go to ballgames, but they'll fill up a rassling ring and put up such a chant it'll scare you to death. We came here because you've got good, hardworking white people here." four of the next five seasons. 12. Carl Pohlad, Minnesota Twins: Because Twins fans apparently didn't suffer enough with a ham-handed racist in charge of the club, they got another rare treat when Pohlad took over ownership in 1984. Pohlad has refused to spend on the team, instead bickering with state officials over a new ballpark and threatening to sell the team out of Minnesota for years. When his buddy Bud Selig suggested Major League Baseball contract two teams, Pohlad offered the Twins up for slaughter. Pohlad started his banking fortune, now valued at $2.6 billion, by foreclosing on the land of Minnesota farmers during the Great Depression. State government recently rewarded his long-standing generosity by bankrolling a sweetheart stadium deal for him using taxpayers' money. 13. Jeremy Jacobs, Boston Bruins: The CEO of one of the largest privately-held companies in the country has refused to share the wealth, shipping many of the team's best players out of town and rendering the once-proud team of Bobby Orr and John Bucyk into an NHL laughingstock. He's also been an absentee owner, pocketing profits from his home in Buffalo. For his stellar contributions, the NHL recently named Jacobs head of the league's board of governors. 14. Harry Frazee, Boston Red Sox: Single-handedly armed the Yankees' dynasty for years, selling off a number of superstars. Most famously, he sold Babe Ruth to the Bombers, purportedly to finance his musical production of "No, No Nanette." The sale had more to do with a holdout by Ruth and a dispute with commissioner Ban Johnson. Still, Frazee passed on the White Sox's impressive offer of Shoeless Joe Jackson and $60,000, opting for the Yankees' offer of $100,000 in straight cash instead. 15. Ken Behring, Seattle Seahawks: Alienated one of the most ardent fan bases in the NFL. Settled several sexual harassment claims. Illegally hunted and killed a number of endangered animals, in one case paying off the Smithsonian to diffuse the resulting controversy. While developing a California country club in the early '70s, Behring and his associates were accused of forcibly removing residents. 16. Barry Shenkarow, Winnipeg Jets: There are many reasons why the Jets left Manitoba for the sunnier climes of Phoenix in 1996. But as far as 'Peggers are concerned, none played a bigger role than Shenkarow's power-hungry stonewalling of efforts to keep the team in Canada. 17. Norm Green, Minnesota North Stars: When the city of Bloomington refused to fund renovations for the Met Center, Green could've approached the Target Center to make the North Stars co-tenants with the Timberwolves. Instead, like so many other owners, he sought out the easy windfall, yanking the team out of one of the country's most hockey-mad markets. 18. Ted Stepien, Cleveland Cavaliers: His repeated ill-advised trades of top draft picks for mediocre players led the NBA to institute the "Stepien Rule," which forbids teams from trading their first-round pick in consecutive years. When a league names a rule after you as a way to protect teams from their own incompetence, that's probably not a good sign. 19. Donald Sterling, San Diego and Los Angeles Clippers: Until a few years ago, the real estate mogul was simply known as the NBA's biggest cheapskate, refusing to spend money on talent and letting the Clippers become the league's designated doormat. Sterling finally opened his pocketbook and signed a few free agents, only to become hated again for driving out blacks and Latinos from many of his apartment buildings. 20. George Argyros, Seattle Mariners: The Southern California-based real estate czar (and former U.S. Ambassador to Spain) once tried to swap his ownership interest in the M's for control of the Padres, which seems preposterous, until you remember that Bud Selig engineered a similar deal for Jeffrey Loria and John Henry a decade and a half later. The Bill Wirtz of baseball, Argyros made it his mission to make the Mariners' payroll the lowest in baseball throughout his nine seasons owning the club, racking up a 670-790 record from 1981 to 1989. If Argyros had hung around a little longer, the Mariners would've traded Ken Griffey for a Denny's gift certificate the second Junior hit arbitration. 21. James Dolan, New York Knicks: Gave Allan Houston a $100 million contract when no one else was offering anything close, paid Larry Brown $28 million to coach the Knicks for one year and employed two of the worst GMs in recent NBA history, Scott Layden and Isiah Thomas. 22 Tom Werner, San Diego Padres: Uberwealthy TV executive who nearly killed baseball in San Diego by slashing payroll and alienating fans. Traded away Gary Sheffield, Fred McGriff and other stars in the great fire sale of 1993, and refused to pay market value for draft picks, letting Todd Helton, Troy Glaus and others bolt for greener pastures. Werner loved synergy, though. In one inspired bit of cross-promotion, he had Roseanne Barr sing the national anthem. 23. Wayne Huizenga, Florida Marlins: Oversaw the first World Series title in franchise history in 1997, then rewarded fans a few months later with what was arguably baseball's biggest fire sale since Connie Mack blew up the Philadelphia Athletics in 1933. After selling the team, he compounded fans' misery by retaining ownership of the Marlins, making it nearly impossible for future owners to turn a profit. 24. Tom Benson, New Orleans Saints: After years of attempting to relocate the team, Benson tried to use Hurricane Katrina as a final excuse to move the team. Class act. 25. Eddie DeBartolo Jr./John York, San Francisco 49ers: DeBartolo ceded control of the team after his stake in an illegal casino venture and ties to the mafia came to light. DeBartolo's brother-in-law York then gained control of the team and quickly became known one of the most notorious penny pinchers in sports history. His mandates included locking water bottles in an equipment cage to prevent overuse, clamping down on office supplies, mailing and shipping costs and banishing local media to a makeshift trailer with no heating or air conditioning. Also, he violated the cardinal rule of running a sports team: He hired Dennis Erickson to coach. 26. Clay Bennett, Seattle SuperSonics: If you look closely, you can actually see him licking his chops at the prospect of yanking the team out of Seattle. 27. Daniel Snyder, Washington Redskins: The kid with the new toy from the start, Snyder has thrown gobs of cash around since the day he closed the $800 million purchase of the team and stadium in 1999. Like Peter Angelos' Orioles, though, Snyder's Redskins have suffered instead of benefiting from his largesse. That's what happens when you install puppets in your front office and make zillionaires out of past-prime veterans like Bruce Smith and Deion Sanders and natural disasters like Jeff George. 28. Ed Snider, Philadelphia 76ers: Spends plenty of money to arm his beloved Flyers with the best talent. Makes up for it by running the Sixers on the cheap and reading the paper once a year to see how they're doing. In a 1999 Philadelphia Daily News poll, Snider was named the city's greatest sports mover and shaker, beating out legends such as Connie Mack and Roger Penske. If by "mover and shaker," the paper meant "guy who's kept Billy King gainfully employed for nine years as one of the worst GMs in sports history," then yes, kudos Mr. Snider for an award well earned. 29. Al Davis, Oakland/Los Angeles/Oakland Raiders: He'd be ranked higher, but many old-time Raiders fans still love the guy, remembering the glory years of Davis' Commitment to Excellence. His steadfast belief in his own GM skills has led Davis to make a series of high-profile blunders, most recently hiring doormat head coach Norv Turner and a statue pretending to be Art Shell. Bonus points for also alienating A's fans by building the gigantic eyesore that is Mt. Davis in the McAfee Coliseum outfield. 30. Georgia Frontiere, Los Angeles Rams: L.A. doesn't need the NFL. But it'd be fun to see the NFL back in L.A.
31. Harold Ballard, Toronto Maple Leafs: George Steinbrenner without the championships. Ballard got in trouble with the law, though he actually did time for his conviction on 47 counts of fraud and theft. A hands-on owner who botched countless personnel moves, Ballard shepherded the Maple Leafs through one of the longest championship droughts in sports, one that's still going 17 years after his death. A 2003 accusation of child molestation -- the charge was eventually settled in civil court -- tarnished his legacy even further. 32. Jeff Smulyan, Seattle Mariners: A media friend of mine had this to say about the Mariners owner who tried to pull the exact same stunt that inspired Rachel Phelps in "Major League": "Jim Lefebvre told me a story that when he was managing the Mariners and it became clear he would be fired at the end of the season, Smulyan told him to play all the rookies in September so the team would lose and their attendance would decrease. Smulyan wanted to move the team to Tampa and the team had an escape clause if attendance fell below [a certain level]. Lefebvre tells the team what Smulyan said and then tells the players, 'Alright, now go out there and only worry about your personal stats so you can get bigger contracts next year.'" 33. David Glass, Kansas City Royals: Hit the trifecta of hatred. Players hate him for his push toward scabs and other strike-breaking tactics during the 1994-95 labor dispute. The media hate him for revoking the credentials of two reporters who asked pointed questions about the Royals' inept management. Fans hate him for sitting on a mountain of cash derived from his Wal-Mart fortune and MLB's generous revenue-sharing plan and deciding that the team doesn't need to spend money to sign and retain good players. 34. Mike McCaskey, Chicago Bears: The grandson of Bears patriarch George Halas acts like any spoiled rich kid: He refuses to share with anyone else, and he doesn't care if you don't like it. His refusal to pay Lovie Smith a market-rate salary after the coach took the Bears to the Super Bowl still sticks in the craw of many Bears fans. 35. Hugh Culverhouse, Tampa Bay Buccaneers: Hey, it's another cheapskate owner! Culverhouse was one of the biggest tightwads in the annals of the NFL, ensuring that the Bucs remain at the bottom of the league throughout his time running the team. His hard-line negotiating tactics made Doug Williams so angry that the Bucs' franchise quarterback bolted for the USFL. 36. Rachel Phelps, fictional Cleveland Indians (the movie "Major League"): Seeking an opportunity to get out of Cleveland, the former Vegas showgirl sold off all of the Indians' good players, hoping to fall below the 800,000-fan attendance threshold that would allow her to void the team's stadium lease and relocate to Miami. The moves made her persona non grata among both Indians fans and players. The team rallied behind a ragtag bunch of over-the-hill veterans, green rookies and sketchy characters, tearing off sections of clothing off a cardboard likeness of Phelps until it clinched the division title and exposed their surly owner -- literally and figuratively. Honorary Mention: Spanos family, San Diego Chargers; Jerry Reinsdorf, Chicago White Sox; Lewis Wolff, Oakland A's; Maloof brothers, Sacramento Kings; Owners not named Walter Brown, Boston Celtics; Tribune Company, Chicago Cubs; Selig family, Milwaukee Brewers (later years); Red McCombs, Minnesota Vikings; Charles O. Finley, Oakland A's; John Spano, New York Islanders; Kevin McClatchy, Pittsburgh Pirates; Robert Short, Washington Senators/Texas Rangers.